42.i Rebecca Jane (Jennie) Nuchols b. Feb 1865. 43.	ii Rachel Emma Nuchols b 11 Sep 1867. 44.	iii James Richard Nucholsb. 31 Mar 1869. 45.	iv Bessie Marie Nuchols b. abt 1871. 46.	v David Edward Nuchols b. 5 Feb 1873.
vi Ellen T. Nuchols b. 21 Mar 1875 in Blount County, Tennessee. She died 20 Apr 1875 in Blount County, Tennessee, and was buried in Piney Level Baptist Church Cemetery, Blount County, Tennessee. 47.	vii Sallie Vance Nuchols b. 26 Mar 1876. 48.	viii Willie Catherine Nuchols b. 16 Feb 1878. 49.	ix Mary Tennessee Nuchols b. 3 Feb 1882.
x	Wesley T. Nuchols b. 9 Feb 1883 in Blount County, Tennessee. He died 9 Feb 1883 in Blount County, Tennessee, and was buried in Piney Level Baptist Church Cemetery, Blount County, Tennessee. xi	Bertha M. Nuchols b. May 1884 in Blount County, Tennessee. She died in Blount County, Tennessee. Bertha married 11 Oct 1904 in Blount County, Tennessee, Charles Lee (Charlie Headrick), (son of John Dunn Headrick and Nancy Donaldson). He was born 27 Mar 1883 in Monroe County, Tennessee, and died 19 May 1909 in Monroe County, Tennessee. 48a. xii Isaac Houston Nuchols b. 8 Mar 1886.
xiii	John W. Nuchols b. 8 Mar 1887, Blount County, Tennessee. He also died 8 Aug 1888 in Blount County, Tennessee, and was buried in Piney Level Baptist Church Cemetery, Blount County, Tennessee. John is said to have had a twin, but cannot locate. b. 5 Jul 1854 in Blount County, Tennessee. She died 20 Jun 1907 in Alcott, Kingman County, Kansas, and was buried in Turon Cemetery, Turon, Reno County, Kansas. Sarah married 13 Feb 1873 in Blount County, Tennessee, Brownlow Rogers Amerine, (son of Richard Wesley Amerine and Sorena Jane Wells). He was born 19 Apr 1852 in Blount County, Tennessee, and died 8 Feb 1933 in Alcott, Miami Township, Kansas. Brownlow was buried in Turon Cemetery, Turon, Reno County, Kansas. Olcott was a small settlement in Miami Township, 3 miles east and 3-1/2 miles south of Turon. Brownlow Rogers Amerine and wife Sarah Jane Nuchols (Sallie) Amerine came to Kansas in a covered wagon in 1883, settling on a farm near Olcott. Kansas (1 mile south, 1/2 west of Olcott). (3 miles west, I mile north.1/2 west of Penalosa, Kansas) in Reno County. They had three children. They came with an uncle, Lonnie Wells and his family. I got this date from Granddad Amerine's obituary. Gertie was born December 25, 1881 in Tenn; Rade in Olcott, Kansas, on September 20. 1884. He was the first one born after they came to Kansas. Lonnie Wells was Brownlow Rogers' uncle, a brother to his mother Sobrena Jane Wells Amerine. Lonnie (Loney), don't know just how it is spelled, they lived on the corner there where Bill and Polly Oswalt live now. I talked to Aunt Mae the other evening to see if she remembered if Grandmother had the sickness she always called Erysipelas, before they came to Kansas or after. She also had something that caused her not to be able to walk. I can remember her telling about being carried around in a little rocking choir. When she did start to walk she walked on her ankle bones; she said that's also what caused her to be so bow-legged. Aunt Mae doesn't remember. but Daddy says he's pretty sure it was after they came to Kansas. I know she wasn't very old. 50.	i William Houston Amerine b. 4 May 1876. 51.	ii Richard Wesley Amerine b. 21 Sep 1879. 52.	iii Emma Gertrude (Gertie) Amerine b. 25 Dec 1881. 53. iv Maynard Theodore (Rade) Amerine b. 20 Sep 1884.
v Charles Leo Amerine b. 11 Apr 1887 in Alcott, Kingman County, Kansas. He died 8 Dec 1964 in Alcott, Kingman County, Kansas. Leo never married. 54. vi Elsie Burgy (Ella) Amerine b. 3 Sep 1889. 55.	vii Mattie Maymie (Mae) Amerine b. 19 Aug 1894.
b. 8 May 1868 in Wellstown, Blount County, Tennessee. He died 31 Dec 1932 in Benton, Polk County, Tennessee, and was buried in Benton Cemetery, Polk County, Tennessee. 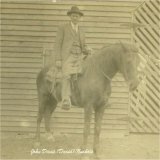 John married 27 Dec 1892 in Blount County, Tennessee, Lossie Dora Barnhill, (daughter of Terrence C. Barnhill and Eliza Jane Harvey). She was born 10 May 1875 in Blount County, Tennessee. Lossie died 15 Apr 1955 in Benton, Polk County, Tennessee, and was buried in Benton Cemetery, Polk County, Tennessee. After graduation from Maryville College, he attended medical classes and lectures at the University of Tennessee. In the summer of 1896 he completed his courses and went to Concord, Tennessee, where he started his practice of medicine. While there, he met Lossie Barnhill and they were married. He came back to Blount County and lived in his mother's home near Union School for a few months in 1899. He and his wife and son moved to Benton, Tennessee, Polk County, in December. John began a practice that lasted for 33 years. He was known as a very successful doctor for a small town. He died of Pneumonia. Dr. Nuchols was active in politics and was a staunch Democrat of his day. He was also interested in better education for Polk County and worked very hard for the high school built around 1914. His son, Charles Samuel, was one of the first graduating class in 1915, consisting of three. Dr John and Mary Anne were active members of First Baptist Church, where she was Sunday School teacher and organist for years. John had some small farms near Benton, Tennessee, in his later years, with agriculture being one of his sidelines, but he remained active in his practice of medicine until his death. A well known member of the medical profession in Benton is Dr. John David Nuchols, who was born in Blount county on the 25th of May, 1868, a son of Richard and Mary (Davis) Nuchols. His paternal grandparents were Thomas and Sarah Nuchols of Virginia, and his maternal grandparents were William and Rachel Davis, natives of Waynesville, North Carolina. The father was born in 1832 and was justice of the peace of Blount county for many years, holding that office until the Union forces took charge of the district during the Civil war. His demise occurred in 1893 and came as a severe shock to all who knew him. He was one of the prominent Masons of his day. The public schools of Blount county afforded John David Nuchols his early [p.554] education and subsequently he enrolled in Maryville College. Upon the completion of his literary course he took up the study of medicine, having formed a penchant for that profession in boyhood. He became a student in the Tennessee Medical College and was graduated from that institution with the M. D. degree in 1890. For the first year after receiving his degree he practiced in Concord, Tennessee, and then removed to La Veta, Colorado, where he practiced for a like period. At the end of that time he returned to his native state and practiced in Maryville from 1895 to 1900, but in the latter year came to Benton, Polk county, Tennessee, where he has since resided. He enjoys an extensive and representative patronage and in addition to his private practice is serving as county physician, the duties of which office he has discharged for the past twelve years. He is a director of the Benton Banking Company. In Maryville on the 27th of January, 1892, was celebrated the marriage of Dr. Nuchols and Miss Lossie D. Barnhill, a daughter of Terrence and Eliza Barnhill. To their union two children have been born: Charles S., whose birth occurred in 1897; and John B., born in 1903. Dr. Nuchols votes with the democratic party, having firm belief in the principles of that party as factors in good government. Fraternally he is a Master Mason, and his religious faith is manifest in his attendance at the Baptist church. Along strictly professional lines he holds membership in the County Medical Society. Mrs. J.D. Nuchols of Benton, Tenn., has been visiting the homes of Mr. and Mrs. A.J. Nuchols and Mr. and Mrs. W.A. Nuchols this week. 55a. i Charles Samuel Nuchols b. 19 Apr 1897. 56.	ii John Barnhill Nuchols b. 29 Jun 1903.
iii. Daughter Nuchols b. 1905 in Polk County, Tennessee, and died 1905 in Polk County, Tennessee. She was buried in Benton Cemetery, Polk County, Tennessee. iv. Infant Son Nuchols b. 13 Jan 1906 in Benton, Polk County, Tennessee, and died 18 Jan 1906 in Benton, Polk County, Tennessee. He was buried in Benton Cemetery, Benton, Polk County, Tennessee.
" Miss Mattie Nuchols, teacher of school No. 1, is progressing lively. I heard a man say his little boy had learned more in one week about reading than he had in two months at other schools." 56-a. i William Garnette Henry b. 11 Sep 1890. 56-b. ii Beulah Henry b. 25 Aug 1892.
iii Samuel Horace Henry b. 20 Sep 1894, Greenback, Loudon County, Tennessee, d. 25 Dec 1947, Blount County, Tennessee, buried, Grandview Cemetery, Maryville, Blount County, Tennessee. He married Stella Molsebee.Sam was described on his draft card as being tall and stout, with gray eyes and black hair. 56-c. iv Mayme Henry b. 30 Oct 1896. 56-d. v George Henry b. 19 Feb 1899.
vi James Duffield Henry, Jr. b. 9 Jun 1902, Greenback, Loudon County, Tennessee, d. Oct 1974, Greenback, Loudon County, Tennessee. He married 30 March 1939 in Terre Haute, Vigo County, Indiana, Madge Cornelius, b. 13 Mar 1904 in Morley, Scott County, Missouri. b. 1 Mar 1871 in Blount County, Tennessee. He died 11 Jan 1928 in Mandan, Morton County, North Dakota, and was buried in Mandan, Morton County, North Dakota. 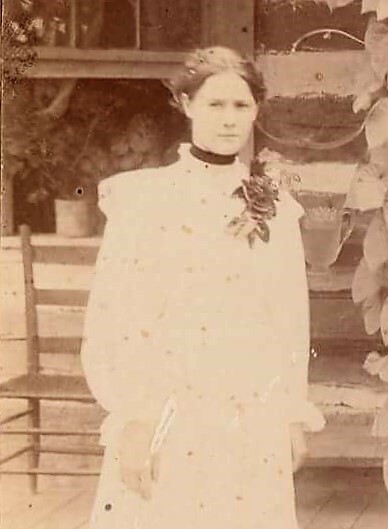 Sam married 15 Sep 1902 in Knox County, Tennessee, Minnie Vance, (daughter of John Vance and Martha Jane Mathes). She was born 20 Oct 1872, and died in 3 Nov 1918. Sam Nuchols was a very promising young lawyer with a great deal of ability. After practicing in Blount County for a short time, he moved to North Dakota, where he was very successful and became judge of one of the courts. He was a brother of Dr. John Nuchols, who moved to Polk County. Judge Nuchols was born in Maryville, Tennessee on March 1, 1871. He attended College and Law School at the University in Tennessee, where he also was admitted to the Bar and practiced law until 1902, when he moved to Mandan, North Dakota. He was City Attorney of Mandan for three years. In 1911 he was appointed Judge of the Twelfth Judicial District, by Governor John Burke, serving until his resignation in 1915. He then entered private practice in Mandan, North Dakota until 1917, when he was elected Attorney General of North Dakota. After serving as Attorney General he resumed private practice for a short time. In 1919 President Wilson appointed him Assistant United States Attorney, with headquarters at Fargo, North Dakota, which position he held until 1921, when he again entered private practice at Bismarck, North Dakota. Judge Nuchols died January 1, 1928. The following was taken from Bismarck Newspaper, ranging in dates from 1906 to 1915, and sent to me by Sandi Evilsizer Koscak. Thanks Sandi!!! Bismarck Daily Tribune (Bismarck, North Dakota) 27 March 1906 Personal - C L Nuchols and Sergeant of Flannigan are with us this day. Bismarck Daily Tribune 01 June 1906 - Dispite the fact that S L Nuchols was urged with considerable strenousness to permit his name to be put on the election ballot opposite Fernidad Leutz as candidate for state senator, he was not so gracious as the others, and up to the present writing, has not yielded his consent. Bismarck Daily Tribune 19 October 1907 - Attorney S L Nuchols was over from Mandan yesterday on legal matters. Bismarck Daily Tribune 16 January 1908 - Mandan presents an Array of Handsome and Talented Candidates For JudgeThe judgeship question is warming up slightly this side of the river. The candidates so far brought to the forefront...Sam Nuchols of Mandan. Bismarck Daily Tribune 22 January 1910 - Mandan Brakeman Arrested For Assault .An east end brakeman by the name of Smith was found guilty of assulting Attorney S L Nuchols by a local justice court Monday and was fined $10 and costs. The defendant, however, threatens to appeal the case.The incident which caused the arrest of Smith transpired one day last week when Mr Nuchols was about to board No 4 for Bismark. No 16 also stood in the local yards and was scheduled to follow No 4 east. Smith claimed that No 4 was filled with passengers and that he should take No 16. Nuchols insisted on riding No 4 and Smith became hostile and committed the assault of which he was found guilty. Bismarck Daily Tribune 17 July 1911 - Judge S L Nuchols and family have returned from Knoxville, Tenn. where they have been a few weeks. Mrs Nuchols and the children went down with the intention of spending the summer. Their baby Samuel Junior, however was taken ill and the judge was summoned two weeks ago . The baby is much better but still slightly ill.
Bismarck Daily Tribune 16 October 1911 - The initiation of Judge Nuchols was one of the great matters of interest. Many friends came to see the judge perform and there were some so mean that they wanted to see him become so gentled that he would eat out of their hand. The judge is a Tennessean and he likes to meet his adversary face to face.....When Judge Nuchols was through he turned to a friend and said that it was as mild and soothin as a Gladstone Hotel bed and Charlie Klaus handed the judge a really good cigar that he just happened to have. i.	Mary E. Nuchols b. 1903 in Mandan, Morton County, North Dakota. She died 1960 in Knoxville, Knox County, Tennessee, and is buried in Knoxville, Knox County, Tennessee. She married Charles Edward Krutch, (son of Edward W. Krutch and Addie Wood). He was born 20 Aug 1887 in Tennessee, and died 26 Oct 1981 in Knoxville, Knox County, Tennessee. He was buried in Greenwood Cemetery, Knoxville, Knox County, Tennessee. Charles was Chief photographer for Tennessee Valley Authority. He left a bequest of 1 million dollars to the people of Knoxville, Tennessee, and on 27 Jun 1985 Charles E. Krutch Park was dedicated and opened in downtown Knoxville, Konx County, Tennessee. 56d. ii. Josephine Nuchols b. 21 Jun 1905.
iii. Samuel Vance Nuchols b. abt 1911 in North Dakota. b. 22 Sep 1874 in Blount County, Tennessee. He died 22 Jul 1941 in Charlotte, Mecklenburg County, North Carolina, and was buried in Elmwood Cemetery, Charlotte, Mecklenburg County, North Carolina. Charles married 23 Jul 1896 in Knoxville, Knox County, Tennessee, Mary (Molly) Francis Lee, (daughter of George Washington Lee and Harriet Elizabeth Satterwhite). She was born 28 Aug 1876 in Sweetwater, Monroe County, Tennessee, and died 28 Feb 1944 in Charlotte, Mecklenburg County, North Carolina. Molly was buried 4 Mar 1944 in Elmwood Cemetery, Charlotte, Mecklenburg County, North Carolina. Charles A. Nuchols and James Duke founded American Hardware and Equipment Company, in Charlotte, North Carolina, on March 29, 1917. Later, Charles bought out James Duke, and the company was then headed by Lawrence, the son of Charles and Molly. i. Infant Son Nuchols b. 6 Jan 1898 in Blount County, Tennessee, and died 7 Jan 1898 in Blount County, Tennessee. He was buried in Piney Level Baptist Church Cemetery, Blount County, Tennessee. 56a. ii Lawrence Day Nuchols b. 9 May 1899. 56b. iii Elizabeth Ruth Nuchols b. 1902. 56b. iii Mary Lee Nuchols b. 12 Nov 1905.
b. 25 Nov 1846 in Blount County, Tennessee. He died 16 Jun 1929 in Blount County, Tennessee, and was buried in Pleasant Grove Baptist Church Cemetery, Blount County, Tennessee. He married 17 Nov 1874 in Blount County, Tennessee, Nancy Florence Broady, (daughter of Thomas Brown Broady and Martha Naomi Clemens). She was born 29 Jun 1858 in Blount County, Tennessee, and died 24 Jan 1916 in Blount County, Tennessee. Nancy was buried in Pleasant Grove Baptist Church Cemetery, Blount County, Tennessee. A Blount County newspaper, in 1886, in Seaton community, said "Elijah Nuchols has the finest sweet potatoes I have seen this year." Another one, said,"Elijah Nuchols, of the firm of Nuchols Bros., is an expert at doing up coffee, as he can wrap up a pound in a paper two feet square." In still another, it said," Mr. E. Nuchols went fishing today, riding his fine Canadian fillies." He seemed to be kept up with, in the community. 57. i Martha Zora Nuchols b. 3 Mar 1876. 58. ii Willie Catherine Nuchols b. 4 Nov 1877.
b. 18 Jan 1852 in Blount County, Tennessee. She died 14 Apr 1921 in Blount County, Tennessee, and was buried in Pleasant Grove Baptist Church Cemetery, Blount County, Tennessee. Sallie married 14 Oct 1869 in Blount County, Tennessee, William Dodd Williams, (son of James Madison (JM) Williams and Rachel Ann Gamble). He was born 14 Jan 1850 in Blount County, Tennessee, and died 21 Jun 1919 in Blount County, Tennessee. William was buried in Pleasant Grove Baptist Church Cemetery, Blount County, Tennessee. i.	William (Willie) W. Williams b. 4 Jul 1870 in Blount County, Tennessee. He died 26 Mar 1871 in Blount County, Tennessee, and was buried in Piney Level Baptist Church Cemetery, Blount County, Tennessee. 59. ii. Nellie Catherine Williams b. 11 Jul 1874. 59a. iii. Tommie M. Williams b. 24 Apr 1883. 59b. iv. Sarah Josie Williams b. in March 1886.
b. 2 Feb 1857 in Blount County, Tennessee. He died 17 Dec 1900 in Blount County, Tennessee, and was buried in Piney Level Baptist Church Cemetery, Blount County, Tennessee. Richard married 22 Feb 1880 in Blount County, Tennessee, Sarah J. (Sallie) Steele, (daughter of Benjamin B. Steele and Melinda Waters). She was born 20 Nov 1861 in Blount County, Tennessee, and died 3 Nov 1904 in Blount County, Tennessee. She was buried in Piney Level Baptist Church Cemetery, Blount County, Tennessee. "Singing at Piney Level is a success. They have elected Richard Nuchols teacher for the coming year." i.	James Wesley Nuchols b. 17 Oct 1881 in Blount County, Tennessee. He died 13 Jul 1892 in Blount County, Tennessee, and was buried in Piney Level Baptist Church Cemetery, Blount County, Tennessee. ii. Nola Malinda Nuchols b. 23 Sep 1883 in Blount County, Tennessee. She died 31 Oct 1902 in Blount County, Tennessee, and was buried in Piney Level Baptist Church Cemetery, Blount County, Tennessee. iii. Homer L. Nuchols b. Jul. 1887 in Blount County, Tennessee. He lived in Ventura County, California, according to the 1910 California census. 59c. iv Elijah Benjamin Nuchols b. 22 Jun 1892.
v.	Thomas Paul Nuchols b. 8 Sep 1894 in Blount County, Tennessee. He died 25 Dec 1894 in Blount County, Tennessee, and was buried in Piney Level Baptist Church Cemetery, Blount County, Tennessee. 59d. vi Gracie M. Nuchols b. in December 1898.
b. 17 Jun 1860 in Blount County, Tennessee. He died 24 Nov 1926 in Blount County, Tennessee, and was buried in Pleasant Grove Baptist Church Cemetery, Blount County, Tennessee. Marion married 22 Jun 1881 in Blount County, Tennessee, Eliza Jane Williams, (daughter of James Madison (JM) Williams and Rachel Ann Gamble). She was born 13 Aug 1865 in Blount County, Tennessee, and died 9 Jan 1945 in Blount County, Tennessee. Eliza was buried in Pleasant Grove Baptist Church Cemetery, Blount County, Tennessee. 60. i Tommie Elizabeth Nuchols b. 15 Oct 1882.
ii. James A. Nuchols b. 27 Jan 1885 in Blount County, Tennessee, and died 15 Sep 1886 in Blount County, Tennessee. He was buried in Pleasant Grove Baptist Church Cemetery, Blount County, Tennessee. iii. Rachel Octava Nuchols b. 20 Mar 1887 in Blount County, Tennessee, and died 19 Apr 1916 in Blount County, Tennessee. She was buried in Pleasant Grove Baptist Church Cemetery, Blount County, Tennessee. 61.	iv William Wesley Nuchols b. 11 Nov 1889. 62. v Charles Clyde Nuchols b. 22 May 1892.
vi. Perry Manley Nuchols b. 14 Jan 1895 in Blount County, Tennessee, and died 7 Mar 1970 in Blount County, Tennessee. He was buried in Pleasant Grove Baptist Church Cemetery, Blount County, Tennessee. Grave marker reads;"PFC BTRY C 114 Fld Arty WORLD WAR 1. 63.	vii James Hobart Nuchols b. 21 Jul 1897. 64. viii John Elija Nuchols b. 30 Jan 1900. 65. ix Katherine (Kate) Jane Nuchols b. 14 Sep 1902.
x.	Mary Belle Nuchols b. 15 Apr 1905 in Blount County, Tennessee, and died 27 Sep 1909 in Blount County, Tennessee. She was buried in Pleasant Grove Baptist Church Cemetery, Blount County, Tennessee. b. 17 Jan 1855 in Blount County, Tennessee. She died 7 Nov 1934 in Blount County, Tennessee, and was buried in Piney Level Baptist Church Cemetery, Blount County, Tennessee. Margaret married 15 Jun 1878 in Blount County, Tennessee, John Riley (Hound John) Coulter, (son of Robert Riley Coulter and Sarah Jane Perkins). He was born 22 Aug 1856 in Blount County, Tennessee. John died 7 Mar 1943 in Blount County, Tennessee, and was buried in Piney Level Baptist Church Cemetery, Blount County, Tennessee. Taken from A Blount County Newspaper "MARYVILLE WATCHMAN"
John Coulter, from the 14th district, was Wednesday on the charge of profanity and disorderly conduct. He will have a hearing tomorrow before Justice Moore. 66.	i William (Will) Houston Coulter b. 20 Jul 1879. 67. ii Nancy Jane (Nan) Coulter b. 19 Sep 1881.
iii	Nora Francis Coulter b. 18 Jan 1883 in Blount County, Tennessee. She died 11 Jun 1892 in Blount County, Tennessee, and was buried in Piney Level Baptist Church Cemetery, Blount County, Tennessee. 68. iv James Robert Coulter b. 13 Feb 1884.
v	Richard Edgar Coulter b. 8 Feb 1888 in Blount County, Tennessee. He died 7 Jul 1924 in Blount County, Tennessee, and was buried in Piney Level Baptist Church Cemetery, Blount County, Tennessee. In the early days of the 1900s, there was plenty moonshine still to be made, and a lot of country people making it. Ed was one of these, whether for sale, or just recreation, I just don't know. In July, 1924, Ed had some whiskey at stored at the old home place, and decided to have a nip, but when he went to get it, there was none there. Right away, he knew in his mind who the culprit was. Benjamin Steele! It was said that Ed said out loud, " I ought to kick his tail", or something to that effect, and proceded to do just that. Now Ed drove a Model "T", and he went to Ben's place, where he was greeted as he got out of the car by Ben himself. It is said that Ed told Ben he came for his whiskey. Ben told Ed that he had better not come up to the house, and had a .22 caliber rifle with him. Ed told Ben that he was coming anyway, and as he got closer to the house, Ben shot him, again and again. Still, with determination, Ed got to the house, entered, and laid down putting his head in Ben's wife's lap, and died there. Ben told that he shot Ed in self defense, as it very well could have been, since Ed was coming after his whiskey that Ben had taken from him. There was a trial in Blount County, and Ben was found Not Guilty. vi	Mary Catherine Coulter b. 13 Mar 1892 in Blount County, Tennessee. She died 22 Apr 1972 in Blount County, Tennessee, and was buried in Piney Level Baptist Church Cemetery, Blount County, Tennessee. 69. vii Josie Coulter b. 15 Oct 1895.
viii	Johnnie G. Coulter b. 11 Feb 1898 in Blount County, Tennessee. She died 28 Aug 1991 in Blount County, Tennessee, and was buried in Piney Level Baptist Church Cemetery, Blount County, Tennessee. Johnnie married 1 Jun 1937 in Blount County, Tennessee, Samuel (Sam) Ogle, son of W. J. Ogle and Mamie McDonald. He was born 24 Jun 1900 in Blount County, Tennessee, and died 18 Mar 1948 in Blount County, Tennessee. Sam was buried in Piney Level Baptist Church Cemetery, Blount County, Tennessee. Johnnie was a librarian for Blount County before getting married. For corrections and/or additions, please contact Bob Nuchols. This page designed & maintained by Bob Nuchols. If you experience any problems, or would like to offer suggestions, contact us!